We supply girds, division plates and support columns in MEEHANITE® alloys. These are made in MEEHANITE® HS and GE 30 for the passes in your converter to the dimensions required. Most patterns are available for existing converter designs. MEEHANITE® HS is used for temperatures up to 1800° F (984° C). 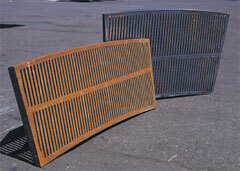 We recommend MEEHANITE® HS grids and columns for Pass 1 conditions to minimize heat scaling, warping and bending. Our converter internals provide many years of excellent service at the operating temperatures and SO2 – SO3 gas conditions in each of the converter passes. This results in reduced maintenance and improved plant operation. Converter internals are made to order at an economical cost and within a timely schedule.